Ben Barker will again lead Redcar’s Championship assault when the tapes rise on the 2018 speedway season next March. 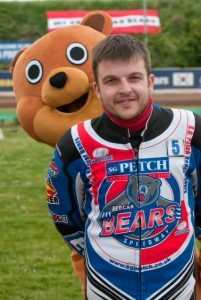 The return of the popular Cornishman to the Media Prima Arena was confirmed to an expectant audience in the SG Petch Bears trackside bar on Thursday and greeted with universal approval. “I think the supporters would have lynched me had we not had made sure Ben came back,” stressed team boss Jitendra Duffill. “He was such a big favourite and the only person I wanted as captain next year. “I’m thrilled and Ben was so keen to return that the deal was actually wrapped up some time ago. “I’m really pleased to have everything sorted out as I made it clear from halfway through last season that the only place I wanted to make my future at was Redcar. “The travelling has been really hard but, if you look at it, the Championship is very much a northern league nowadays, so it doesn’t make much difference which club I’m racing for. “If you are a speedway rider from Cornwall, you know you are going to have to travel! Duffill continued: “Team building is well under way and I would hope to have it finished in the next couple of weeks. Keay and Duffill are known to be scouring the globe with a good chance that an established rider, not currently associated with a British club, could shortly be on the way to Teesside. Courtesy of Keith McGhie and the Gazette. Previous story Help the Bears raise some extra money!